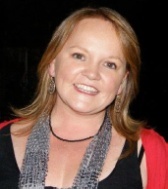 Annabelle Hart and Jason Pinder own and operate Hire a Hubby’s Doncaster East territory in Melbourne’s eastern suburbs. With four children, two staff, several subcontractors and a growing business, “running the books from home” is a whole lot more involved than the little part-time job Annabelle first envisaged. With all these hats to wear, organisation is key. I’m a list maker from way back. I make lists about lists. Sometimes my list even says “check other list”, or “check yesterday’s list”. Sometimes I actually read the list; sometimes it’s just the process of writing the list that makes things stick in my head and jump out at the right time; like, “Collect kids from school” or “feed the dog before she eats a hole in the back door”. Some lists I tend to be more stringent about, like “pay electricity bill” and “fix flat tyre”, but I guess that’s the wisdom of experience meets hindsight. I’m beginning to wonder if lists are contagious, genetic even. In the weeks leading up to his birthday, my son, Mitchell, announced “We’d better make a list” when talking about what needed to be organised and done before the big day. He was six. But then again, not everyone is a list lover. My father thinks lists are ridiculous. He jokes about an old Aunt of mine whose list includes “get out of bed” and “brush teeth”. I daren’t tell him that I’ll often write things on my list that I’ve already done that day, purely for the joy of ticking them off immediately. Wake kids up: check. Walk dog: check. Mow lawns: check. Boy, look how efficient I am, best stop for a coffee… Actually that last one about the lawns is a lie. I don’t mow the lawns anymore. I get Hire A Hubby to do it. Mind you, if I just asked my Hire A Hubby it’d never happen. In the Dictionary According to Men, that’d fall under the category of nagging. No, I find it much more effective to book a job with him. I really do book one too; I send a job request through to his work phone just like one of our customers would, “Mow lawns at Faraday”. I add it to his list, so to speak. For me, yesterday’s list, without a word of a lie, included: drop kids at school; collect our malfunctioning Gerni high-pressure cleaner from site and return it to Bunnings to be replaced, drive back out to site with a new one so that our client’s paths could sparkle; collect and deliver six flyscreens to be re-sized and mended; collect a concrete saw from site and re-deliver to Kennards hire (picture me in my pink Hire A Hubby shirt being the only girl in the tool shop and trying to look like I knew what to do with such a ghastly looking saw); source a custom made entrance door and door frame for a client’s new house; book a gutter clean, a paving job, and an inside plaster patch and paint; invoice four clients; book our electrician to fix a client’s flashing down-lights and our plumber to replace another’s leaking shed roof; deliver an extra lunch to one forgetful male in the house because in the morning I’d forgotten to put “take sandwiches out of freezer” on my list; collect children from school; cook dinner; clean out our dishwasher filter so it works again; and run two loads of washing. What wasn’t on the list was, “find some time to relax and have a quiet glass of red”. 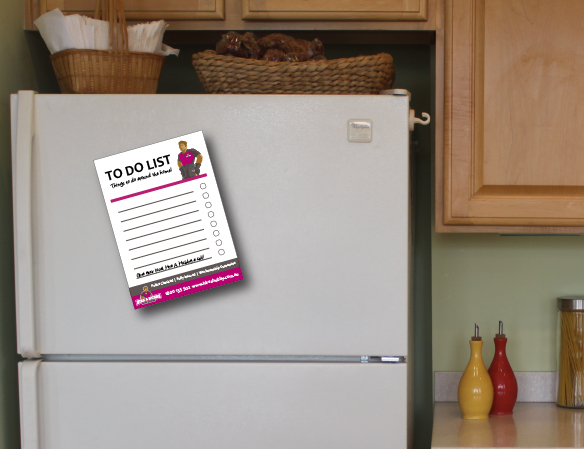 This month, you can visit local Hire A Hubby to get your own “to do list” fridge magnet so you can record and remind yourself about all the property maintenance jobs that need doing.